This is one of my favourite drawings from my daughters recent offerings, she draws pictures all the time and always wants to be drawing, colouring or making things, she reminds me of me when I was a child. 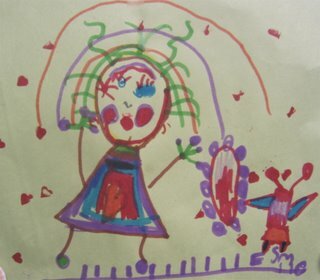 Today was parents evening, Esme is a good girl in school, and it is so lovely to have someone else (in this case 2 people, as the teachers jobshare and do half a week each) tell you how fabulous they think your child is. It was really lovely and I walked home from the school with a big smile on my face. 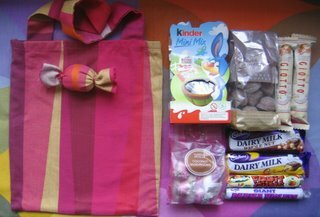 Another thing that had me smile today was going to the post office to post my candyswapper parcel to my swap partner in America. I know, its a day late, but the children were unwell yesterday so we couldnt get out of the house. I am very easily amused, we have a lovely old-fashioned local post office, it is part of our corner shop, and the couple who own and run it make every visit enjoyable. I love the chit-chat and general ambiance of the store, and the excitement (for me - it's a novelty) of posting someting all the way to America. The swap is secret, I think, so I will not tell who the recipient is yet, but here is a look at what I sent. The swap theme was local chocolates. 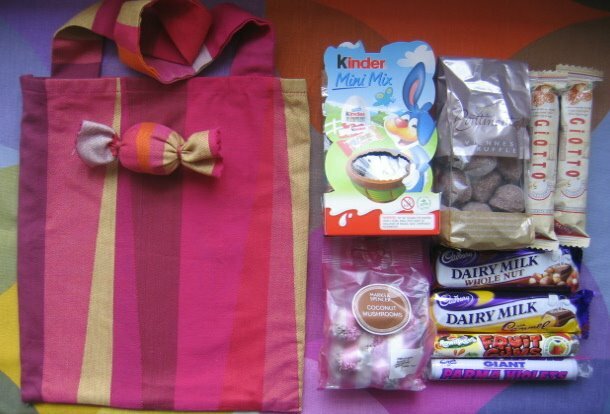 I tried to put some british 'greats' in, some cadburys dairy milk bars, Thorntons viennese truffles (my favourites) Fruit gums, Parma violets and some cute coconut mushrooms. I also put in a kinder egg-who can resist?? and a couple of giotto bars, not very local, but sure to be a hit with my partner. I am only sad that I was not able to include any dark chocolate, there was some in there, but the weight was too much, so that the postage alone topped the suggested budget. Something had to go, and I am eating that here now, I hope she understands!!! I was still over budget, but only a few dollars phew!!! I made the little bag to put the candy in, with a detachable sweetie on the front. I hope my partner will like it, I tried to use fabric that I thought she might like, from what I have learnt of her from her blog. It was some material I already had in my stash, but I thought it would be nicer than just slinging the candy in a plastic bag to post. I am pleased with it anyway. I am having difficulties with blogger tonight so I hope this page will upload ok, and I might have to add the pictures over the next day or so. Hannah, I just got your package today and loved every bit of it! I can tell you put a lot of thought into the swap and especially loved the bag you made. Not only is it perfect for my treats, it's great for my small knitting projects! Thanks again!